Keyboard commands: toggle moons = i, e, g, c, slower = s, faster = f, play or reset = spacebar. The orbits of Jupiter’s Galilean moons transform from rhythms to notes as their motion is sped up from 30 thousand to 250 million times their actual speed. This corresponds to 15 to 28 octaves above their actual frequencies and as they begin orbiting faster than 20 times per second (20 Hz), the repetitive beat morphs into sustained musical harmony. This demonstrates that rhythm and pitch are the same thing, perceived at different speeds. The inner 3 moons Io, Europa, and Ganymede are locked in a 4:2:1 orbital resonance which means they playing the same note but in different octaves. Callisto and Ganymede are nearly in a 12:5 resonance so that the notes they create are close to an octave and a minor 3rd apart. The crazy geometric patterns are a type of optical illusion called aliasing (or the wagon wheel or stroboscopic effect) which occurs when the moons orbit too fast to be represented by the limited frame rate. As time is sped up the inner three moons can be seen to lock into their patterns together due to the simple relationship between their orbits. When the orbital motion of the Galilean moons is sped up by 250 million times (28 octaves above their true pitch), the three inner moons all produce an A note due to the 4:2:1 resonance between their orbits. Callisto is not locked into resonance but it completes just over 5 orbits for every 12 of Ganymede, producing a low F#. Shortly after discovering 4 large moons orbiting Jupiter in 1610, Galileo noticed they were playing a remarkably musical beat. 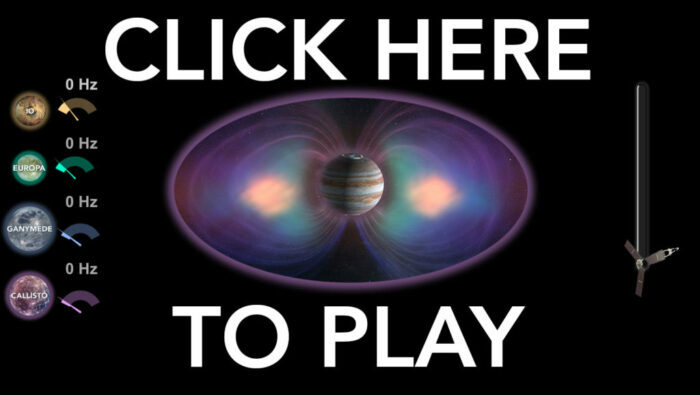 In the time it takes Ganymede to orbit Jupiter, Europa orbits twice and Io orbits 4 times. The three moons are locked in an orbital resonance, dancing together in a tight repeating pattern. 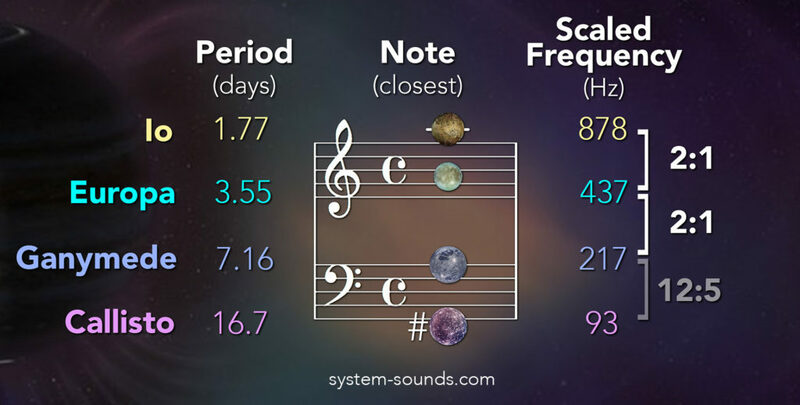 When heard as musical pitches, these moons are playing the same note but in different octaves because their frequencies are related by factors of 2. This indicates that the orbits of the moons were carefully tuned to each other shortly after they formed while they were still migrating through a disk that encircled Jupiter. 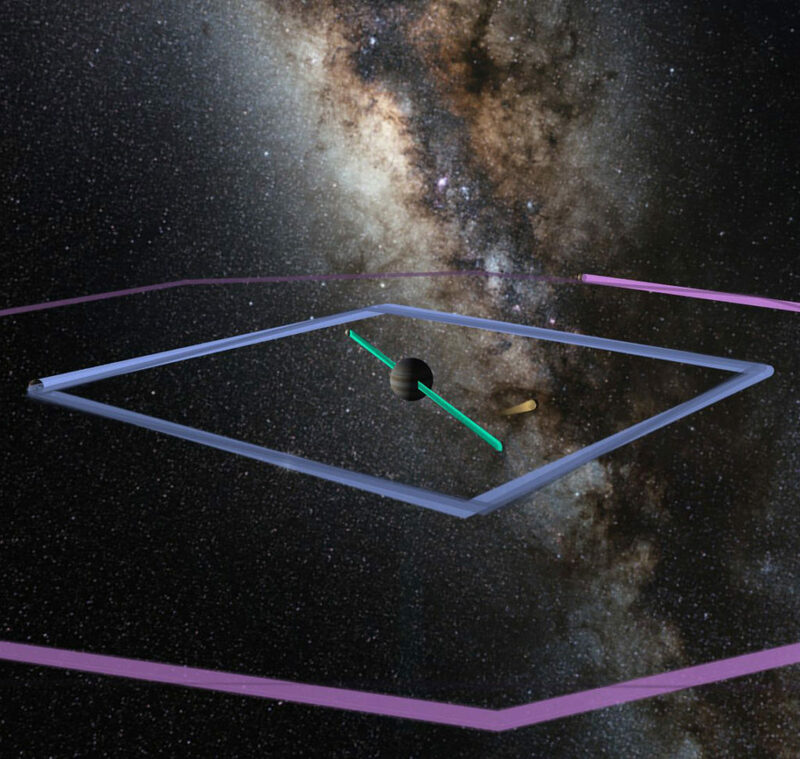 It turns out that the 4th moon Callisto is dancing to the beat of its own drum. Although it’s not locked into resonance with the other moons, it happens to complete close to 5 orbits for every 12 orbits of Ganymede. When sped up to produce a pitch, this pattern creates the interval of an octave plus a minor 3rd, adding a dark twist to the purity of the inner three moons. For the most dramatic example of orbital resonances in planetary systems, watch our video on the life-saving music of TRAPPIST-1. Have you ever seen footage of a car wheel spinning so fast that it appears to stop and start spinning backwards? When the frame rate of video footage is too slow to accurately represent a spinning wheel or an orbiting planet, your brain fills in the gaps between the frames it does capture, making it appear to rotate at different speeds or in the opposite direction. In this case, the orbit trails connect the dots between each moon’s location from frame to frame, no matter how it actually moved between the frames. As time is sped up, each moon creates a series of polygons. You may notice an interesting pattern in the progression of the number of sides to each polygon. The inner three moons can be seen to lock into different aliasing patterns together, a direct result of their orbital resonance. For example, at the moment captured on the right, Io completes a full orbit between frames and appears to be nearly frozen in place. Since Europa moves through only half of its orbit in this time, it appears on either side of Jupiter and connecting the two images forms a line. Ganymede then forms a square since it moves a quarter of its orbit between frames. Heading image processed by Gerald Eichstädt and Seán Doran.